Happy Anniversary, RWBY RPG! It's that time of year again already, and you might be wondering why I'm posting today instead of on our actual anniversary, huh? I'll get to that, I promise, I have some info to run through first but it's definitely for sure not because I'm embarrassed to have our anniversary on 9/11. As we finish out our fifth year on the site, enter our sixth year, and move toward the sixth season of RWBY, there's some stuff that I've personally been thinking about in regards to not just the site but the show and fandom as a whole. Over three years ago, we lost the dedicated and inspiring man who was behind the entire existence of all three of those things, without whom we wouldn't have ever been here. It has been said many times and I'm sure I don't need to say it, but Monty was truly someone to look up to, his work ethic was bar none, he was able to do what he truly loved, and he inspired people to improve their creative skills. If you've been on this site since the beginning, if you've even been here for just a year, or if you've been anywhere in the Fandom where you're creating works of art whether it be drawn, written, or otherwise you can't deny that Monty changed your life. Perhaps you were already a published author, perhaps you never wrote a story or character in your life, perhaps you had your art win contests, perhaps you could only draw stick figures. No matter the starting point, I firmly believe that everyone is better off for having Monty in the world as he helped countless people strive to improve. I genuinely believe that there isn't a single person, at the very least on this site, whose writing or art skills haven't improved from a year ago, even if only by a little bit. Had Monty not brought us together, I know at the very least I would still be writing like I was 6 years ago when I first joined the site. You'd be hard pressed to find anyone in or out of the community that can't look up to Monty in at least one aspect, his works and ethic were undeniable. When we lost him, many were skeptical about Miles and Kerry taking over and whether you like or dislike how they've handled the show, it is impossible to deny that if they hadn't continued the work of their friend 3 years ago, we wouldn't be here today. The community would have burnt out and faded away. Because they carried on for Monty, because they put in the effort to not let his project die, we're still here, we're still writing and drawing and making works of art, we're still improving. Myself and the other members of the staff believe that this is an excellent time to thank the cast and crew of RWBY and pay tribute to Monyreak “Monty” Oum. With that said, you get half the anniversary present/tribute now and half on the 11th. Once the 11th rolls around we'll be getting a shiny new revamped logo for the site, showcasing some of the more we'll known characters of our own making on the RPG side and a revamped version of the original logo on the main side. you may have noticed a change already. Our old site logo has been revamped and replaced. While some of you have seen me work on the logo in the discord, for those who haven't seen it, the characters are starting from the top and going clockwise: Leonius Decimi Regulus, Juno Vert, Prism Skylark, Zabar Aga, Calen Shrike, Chiu Fei Hung, Nathan Eau, Coconut Cream, Alban Inverno, Malina Nahualli, Kirkka Scarlet, and Janus Rogo). 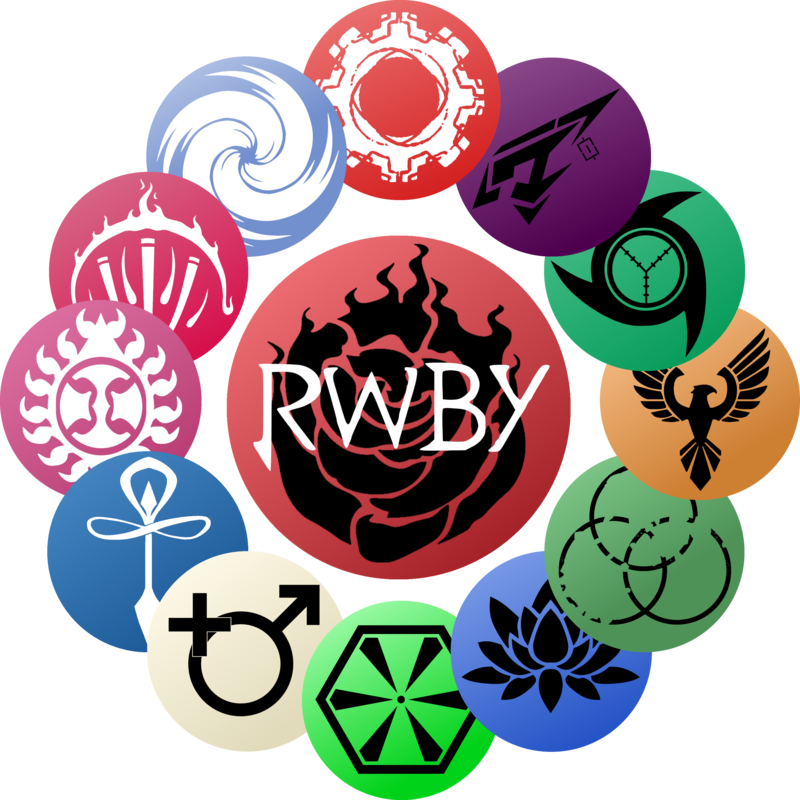 On the RPG logo the center has also been revamped with “RWBY RPG” appearing on Ruby's symbol while on the main side logo, the center has been replaced with a shaded white ball that simply has “RWBY” and Adam’s symbol has been replaced by Ruby's. Much more important than a change in our logo, though, is the main event and reason I'm announcing this at the start of the month and not on our anniversary. The weekly writing prompt is going to be delayed this month, as the entire month is going to be dedicated to a single prompt, more info can be found at the link to the writing prompt link at the end of this post. As I said before, this anniversary isn't just about our site, it's about RWBY, the community it's nurtured, and the cast and crew that makes it happen. It's about paying tribute to Monty and thanking Miles, Kerry, and the rest of the staff. For this purpose, an invite has been spread to r/RWBY, r/RWBYOC, r/RWBYPrompts, r/RoosterTeeth, and the RWBY section of the RoosterTeeth Forums. You won't need an approved character to enter this time. I feel confident in saying that in the years since, we have all been doing creative work and that it's time we pay tribute and thank the staff for continuing Monty's work. We're allowing all who join to participate and at the end of the month, each and every prompt marked “Opt-in” will be compiled into a binder of stories put together by myself with a letter of thanks and a signature from each person who wrote in to be sent to RoosterTeeth. We had tried to get permission to compile the stories into a properly made and bound book by a print-on-demand service but despite multiple attempts at reaching out to roosterteeth’s fan project email we never got a response. While all those who opt-in will be featured, we will have a vote decide on the best response, which will be at the very front of the binder, second only to a foreword and thank you letter. How the voting will be done has not yet been decided on yet but we're open to fair suggestions. It's been a fantastic five years of RWBY, here's to many more.